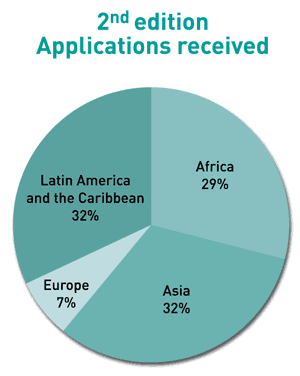 28 applications were received for the 2012 edition of the Award. 22 for category 1 'Best water management practices'. 6 for category 2 'Best participatory, communication, awareness-raising and education practices'. *Composition of macro geographical (continental) regions follows the UNStatistics classification method. The designations employed do not imply the expression of any opinion whatsoever on the part of the Secretariat of the United Nations or the International Decade for Action 'Water for Life' 2005-2015 concerning the legal status of any country, territory, city or area, or of its authorities, or concerning the delimitation of its frontiers or boundaries.